The project consisted of the demolition of the existing dining room annexe of the existing school and retained the Main electrical distribution switchgear in the basement of the annexe including the HT incoming supplies. The new music and drama building was constructed on the footprint of the existing annexe. Mechanical and electrical diversions as required to isolate the works area and allow the remainder of the school to function normally. Alterations to main services infrastructure support systems to serve the planned new music and drama extension. 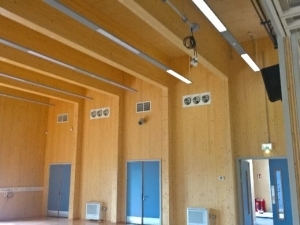 Supply, installation, connection, commissioning and setting to work of new mechanical and electrical services to the music and drama extension including all mechanical ventilation, air conditioning, domestic services and electrical services including stage, sound and lighting systems.